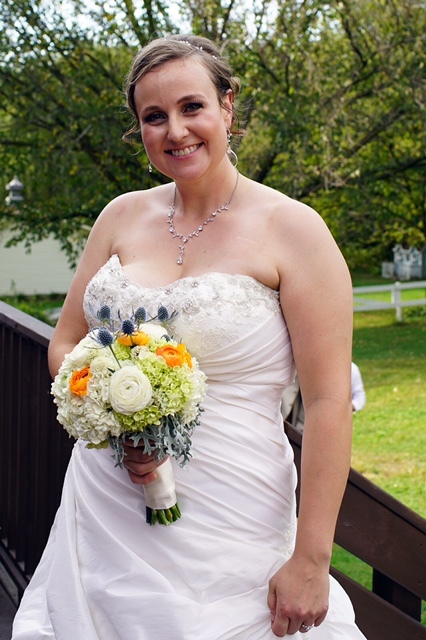 Welcome to Katy Bloomquist's MWOY Fundraising Page! Many thanks for the generous support of LLS and my efforst! I have been humbled by this process and the kindness of so many! It's ironic that we started this campaign with a blood test for Scott and are ending with another blood test for Scott - the PSA blood test after the prostate cancer surgery was not the results we wanted but we are mainting a prayerful hopefulness!!!!! Meanwhile he continues to recover well post surgery and will be at the GALA! Thank you for supporting me in my efforts to run for WOMAN OF THE YEAR for the Leukemia and Lymphoma Society. I accepted my nomination for this campaign months before my husband, Scott Freitag, was diagnosed with “high risk prostate cancer”. Unfortunately, we are in the majority of people these days who have had a personal cancer diagnosis or have lost a loved one to this horrible disease. I have known many who have battled blood cancer over the years. 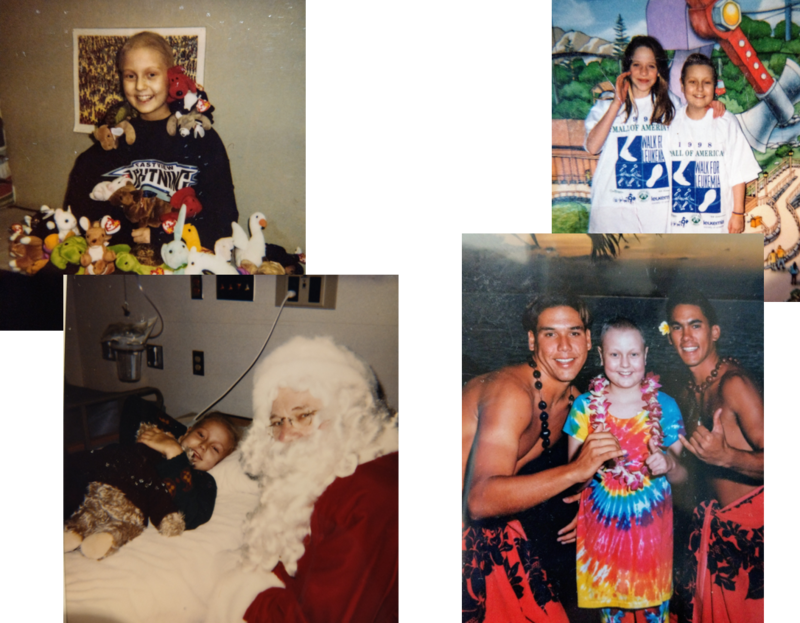 I was first acquainted with blood cancer when my cousin Patti successfully battled childhood Leukemia at the age of 10. Her courage and wisdom at such a young age impacted my life mission. In the ensuing years both friends and family members fought blood and other cancers, some won their battles, others did not -- This further motivated me to become an enthusiastic supporter of LLS. I have raised thousands of dollars and competed in a number of athletic events to support cancer research. The interesting thing about blood cancer research is that studies on blood (a liquid easily removed from the body) is easier than working with tissue, and the new therapies that are developed for blood cancer are used for and benefit all cancers. My mission is to support blood cancer research because that is how we will find a cure for all cancers! It is a rare family that has not been impacted by this disease. The work that we do together to support this research may well benefit your own family - as is my experience now. Today, one of the treatments developed just last year through blood cancer research is being used in a clinical trial for prostate cancer!!! The Leukemia & Lymphoma Society's (LLS) Man & Woman of the Year campaign is a fundraising competition to support blood cancer research among a group of motivated and dedicated individuals in communities across the United States. 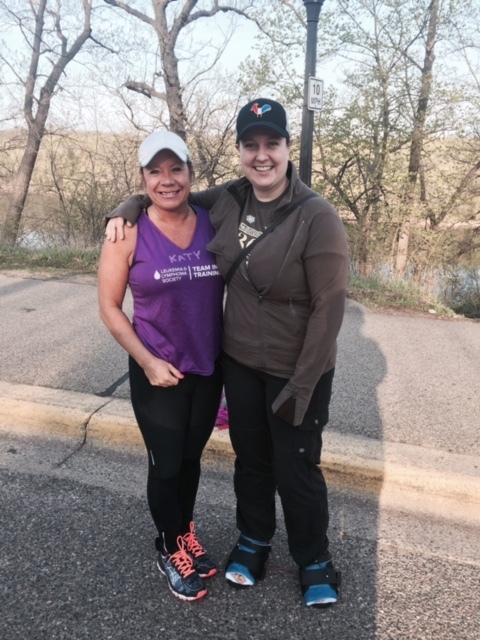 I’m running in honor of the Minnesota Chapter among 14 other candidates. Each dollar raised counts as one vote. The male and female candidates who raise the most votes (the most money) during the 10-week campaign are named Minnesota Chapter's Man & Woman of the Year at the Grand Finale Gala on May 19, 2018 -- SAVE THE DATE!!! ~ Donate now by selecting the "DONATE NOW" button on the right! ~ You can make a donation for the Grand Finale live or silent auction. I am looking for gift cards, spa packages, vacations packages, celebrity outings, tickets, autographed items etc. ~ Come to the Gala on May 19 – buy a table or tickets by clicking the "PURCHASE EVENTS TICKETS" button on the right - ladies wear a red dress and men wear a red tie for our crimson cures team! 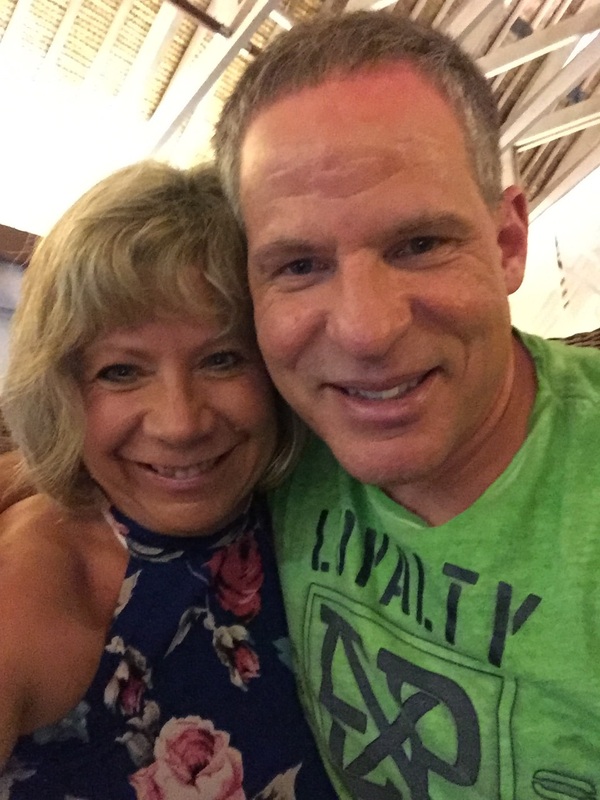 Many of you have supported me through my LLS team in training pursuits- marathons, century ride, and the Ironman- I thank you again for your support! Throughout my time with team in training, as well as serving on the Board of Trustees, I have been very impressed and gratified seeing the advances achieved by the funds we have raised! Just last year the FDA approved 18 new drugs for treatment of blood cancers (which will then go on to help all cancers). LLS keeps its overhead low and focuses on the mission. The progress in treatments is gratifying, but it is not enough -- until no one gets a call that says, “I am sorry but you have cancer” or “I am sorry but there is nothing more we can do”, or the phone call or caring bridge post notifying you that someone lost their battle to cancer. People have a variety of philosophies for charitable giving. I appreciate and respect each person’s choice to help because truly, every donation – no matter the size or scope -- makes a difference. I look forward to hearing from you. God bless you and your family. Please don’t hesitate to contact me with any questions. Join me for the Grand Finale Gala! Click the "Purchase Event Tickets" button at the top of my page to purhcase your gala tickets! He was recently diagnosed with “high risk prostate cancer”. He starts treatment in mid-March. Thoughts, prayers and donations are greatly appreciated! "I lost my daughter Amanda due to complications from blood cancer. There is not a day that goes by that her family and I do not think about her! It’s our hope that through continued research others do not have to endure what Amanda and our family has experienced." Dave Nordgard, Amanda's father. We celebrate her struggles, her fight and her life and we raise money in memory of her - the fight continues! Lauren was diagnosed with AML. She beat her first battle but lost her second in January of 2018. We celebrate her struggles, her fight and her life and we raise money in memory of her - the fight continues! Zach lost his battle with Lymphoma. We celebrate his struggles, his fight and his life and we raise money in memory of him - the fight continues! Fundraising Events Benefitting my Man and Woman of the Year Campaign! 5th Annual Miracle Party Benefitting LLS! Miracle Party tickets are $25 per person. Please visit www.LLSMiracleParty.org to purchase your tickets today! KIDS & DOGS ARE FREE! 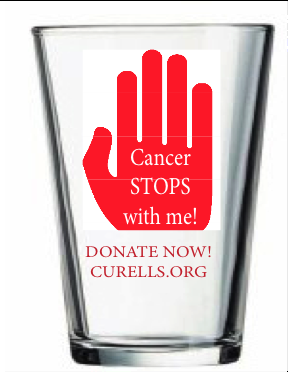 Your ticket includes a "Cancer STOPS with me glass, pizza from Joey Novas and two prize drawing tickets! 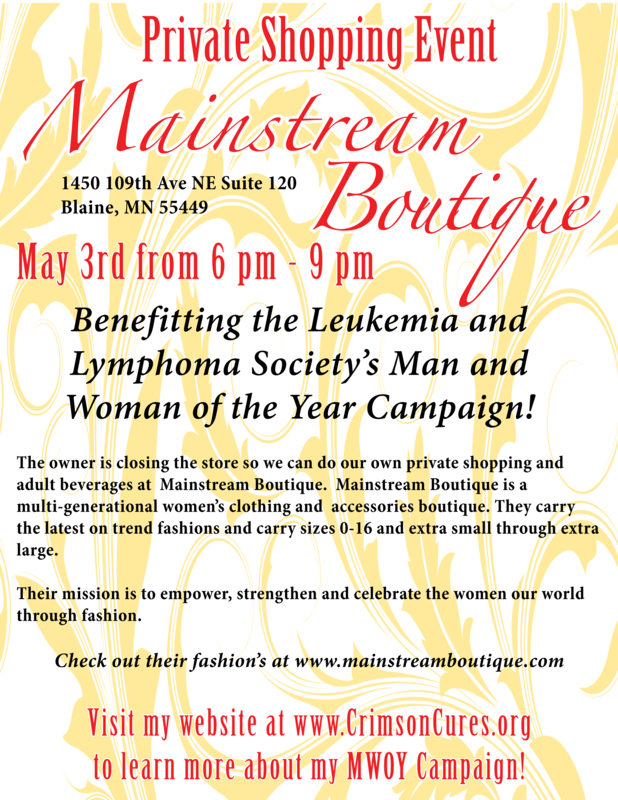 Private Shopping Event at Mainstreet Boutique!